In a marathon meeting that gaveled to a close at 2:40 a.m. Tuesday, the Missoula City Council approved its fiscal 2019 budget after nearly 200 citizens filled the room and hallway to protest the accompanying property tax increase. 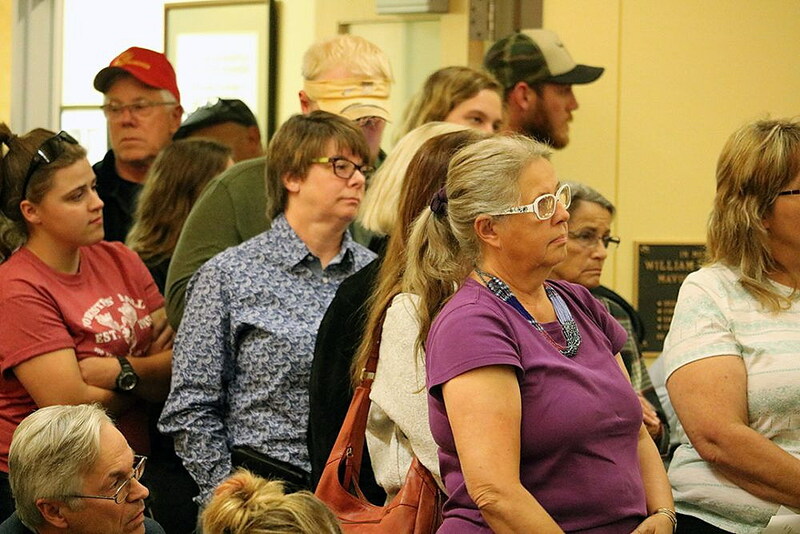 About 50 citizens stepped to the microphone – some of them multiple times – during nearly six and a half hours of debate and $2.3 million in budget cuts proposed by Councilman Jesse Ramos. Fueled by pizza distributed by the Missoula Republican Party, several tax protesters suggested closing Splash Montana, the city’s popular water park, and telling families to swim in the river instead. They wanted council members to forgo a cost-of-living raise included in the budget, and even to cut their wages (and those of the mayor) by 3.85 percent – in a show of solidarity with taxpayers who face a 3.85 percent city property tax increase. 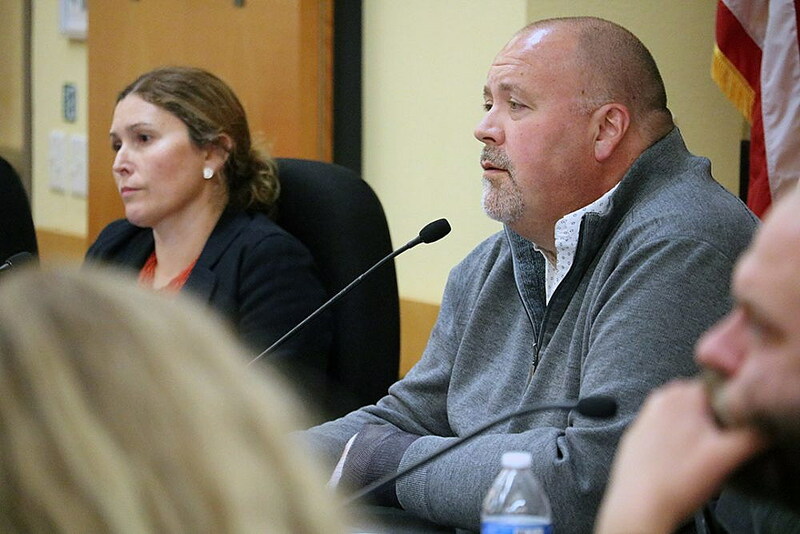 By 12:30 a.m., Ramos was holding his head as the comment-making veered ever-further afield from his proposed budget cuts and his fellow council members became increasingly agitated. Veterans advocate Ed Lesofski rose at every opportunity to complain that the former service men and women he helps cannot get the medical care or counseling they need from the VA.
“You’re debating whether to keep a pool open for a bunch of kids and I’m trying to save people’s lives,” he said during one particularly emotional outburst for which he later apologized. Perennial council critic Kandi Matthew-Jenkins claimed the city’s budget was the work of the Communist Party – “and don’t you try to deny it.” Later, she offered to help members of the audience launch a recall effort. In the end, only one change in the $58 million budget was approved. After hearing a Missoula police officer’s testimony about the need for more officers, Councilwoman Julie Armstrong proposed an amendment delaying for one year an $87,000 study of the condition of pavement on the city’s streets and to instead use that money to add another police officer. The budget already added two officers to the force, but the Missoula Police Department had requested three new officers. Because the new officer must first attend the Montana Law Enforcement Academy, the money will pay for half a year’s salary and benefits. Armstrong said she was convinced by the testimony of Stacey Lear, a city police officer for the past 12 years. Lear told council members that violent crime in Missoula has significantly increased in recent years and officers on the force are working enormous amounts of overtime because there simply are not enough of them. Last year, Lear said, she worked 273 hours of overtime. Even with the extra hours, the force has no time for proactive crime prevention, she said. “Our officers are quitting because of the burnout,” she said, and because they’re missing out on so much of their children’s lives. Lear said the MPD should have 138 officers to properly match the city’s population. It has 104. All council members voted in favor of eliminating the pavement study and instead hiring another police officer. Many residents offered heartfelt testimony about the hardships they are facing because of property tax increases in recent years – not only by the city, but by Missoula County and Missoula County Public Schools. In fact, a budget explainer distributed at the meeting by city officials showed that in fiscal 2018, for a median-priced home, city taxes were 29 percent of a homeowner’s total tax bill. The biggest taxing entity for a Missoula County property owner is MCPS, which accounted for 37 percent of 2018 taxes. The county was responsible for another 18 percent. Bill Murray told council members that he has lived in Missoula for most of the time since 1970 and has worked hard to make a decent living and pay his taxes. From 2013 to the present, their disposable income – from Social Security and teacher retirement – has increased 4.9 percent, Murray said. In that same time, the couple’s taxes have gone up 29.9 percent. “We don’t need everything,” Murray said, encouraging council members to find more ways to cut city spending. Susan Reneau, long an active member of the Missoula Republican Party and many civic causes, encouraged council members to forgo the cost-of-living pay increases included in the budget — $40 a month for council members, $240 a month for Mayor John Engen. “There is sacrifice in public service,” she said. 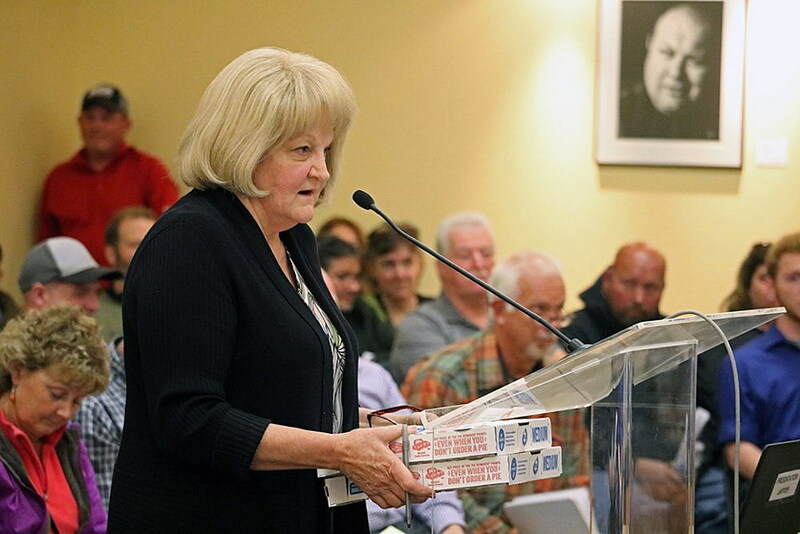 Former city councilwoman Lyn Hellegard suggested the council begin working now on the fiscal 2020 budget – to look for ways to significantly cut back on expenditures. “We don’t need all the splash parks and ballparks and the like,” she said. Former council candidate Cathy Deschamps said she understands that voters placed some of the extra county taxes on themselves by approving bond issues for a new regional park at Fort Missoula and a new Missoula Public Library. For their part, council members said they understand the burden higher taxes place on local residents because they, too, are taxpayers. But they defended the programs targeted for cuts by 15 amendments offered after midnight by Councilman Ramos. All but two of the cuts had been suggested by Ramos at a council committee meeting last week, and were debated and turned down at that meeting as well. Ramos, for example, wanted to eliminate the city’s $100,000 contribution to the public-private fund that allows Missoula’s Mountain Line bus system not to charge fares. Council members were passionate in their defense of the Zero Fare program. What would it hurt to ask riders to pay? Ramos asked. Only 27 cities in the United States have free public bus service, he said. Council members continued to push back against Ramos and the Republican Party leaders who organized some of Monday night’s protesters. They voted down amendments to cut the city’s contribution to the Missoula Economic Partnership, to cancel the city’s contract with Arts Missoula, to pull $203,000 from the aquatics budget and more. Councilwoman Mirtha Becerra said she heard what citizens said in their testimony and will take it into account in the year ahead. She also said she knows their suffering because she, too, has experienced hardship – as a woman, a mother, an immigrant, a low-income earner.